This exciting new book is not only a high quality Art Book including full page high resolution photographs, but each of the artists has included a sequence of steps to some part of making or engraving their featured art knife for the book. 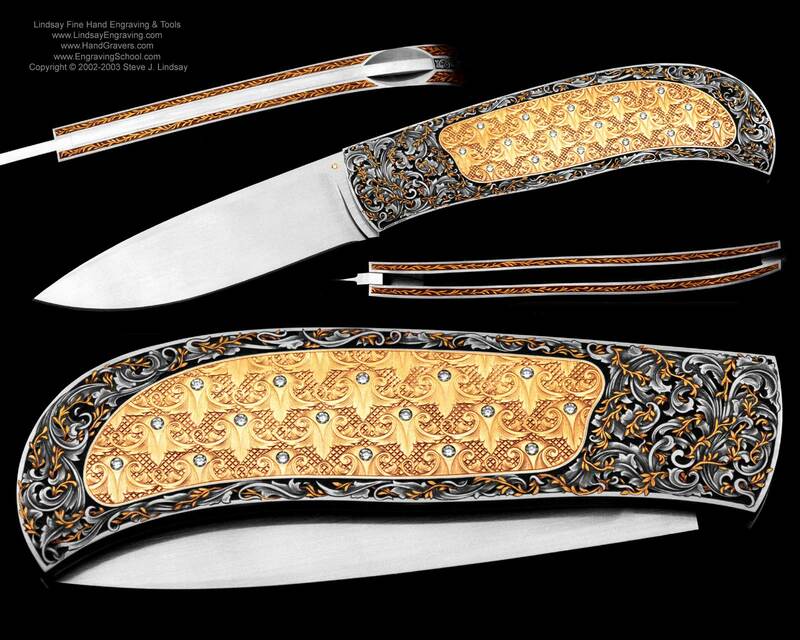 For instance, knife maker Tim Herman discloses his highly sought after "color engraving" techniques in his section and knife maker Fred Carter illustrated the sequence on how he overlays gold for a dragonfly on his exquisite featured folding art knife. To complete the documentation of this astounding modern art form, a group of the artists wrote an original introduction to the book that displays the various aspects of this modern art form, as it has never been shown before. The introduction includes the topics: The Art of Mosaic Damascus (Steve Schwarzer), The Art of Engraving (Steve Lindsay), The Art of Scrimshaw (Linda Karst Stone), Anodizing Titanium (John Lewis Jensen), Locking Mechanisms in Folders (Ron Appleton), Knife Shows, Collecting Hand Made Knives (Bud Lang) and Collecting as a Way of Life (Dr. Pierluigi Peroni), all covered in detail with original illustrations prepared specifically for this section. Part I - The art of . . . Ray and Ron Appleton; Van Barnett; Dr. Fred Carter; Jerry Corbit; George E. Dailey; Dellana; Kaj Embretson; Henry H. Frank; Johan Gustafsson; Harumi Hirayama; Tim Herman; Howard Hitchmough; Steve Hoel; John L. Jensen; Joe Kious; Steve Lindsay; Wolfgang Loerchner; Jim and Joyce Minnick; Steve Schwarzer; Jurgen Steinau; Buster Warenski; Glenn Waters. Part II - The art of . . . Allen Elishewitz; Antonio Fogarizzu; Koji Hara; Peter Marker; Kansei Matsuno; Franchesco Pachi; Scott Sawby; Brian Tighe; Michael Vagnino. The eight-page sections dedicated to each of the 22 Featured Artists (Arranged alphabetically after the introduction) consist of the artist's picture, biography and personal signed statement. A photographic sequence showing the artist creating one of the features of a folder made specially for the book. Trimmed page size: height 11 1/2" x width 9", 170g semi-matt coated art paper; printed protective mat varnish. First limited edition. Visit Tim Herman's site to see his knives and amazing color engraving.